Wherever you are on your unique path, we invite you to come walk with us! 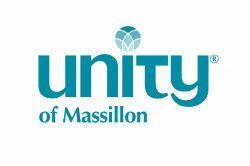 At Unity we believe, honor and respect the many paths to God. 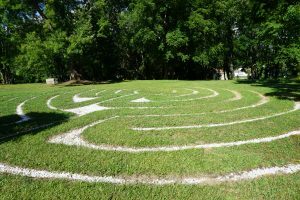 We are happy to present our labyrinth …to all; whether you are seeking enlightenment, answers, solace, or simply a peaceful stroll to clear your mind, you are welcome to enjoy its tranquility. Known today as the Cretan or 7-circuit labyrinth, it consists of a single path winding back and forth to a center point in a series of seven concentric rings. The history of this symbol is not completely clear; we do know that the design has been passed on through many generations and cultures. 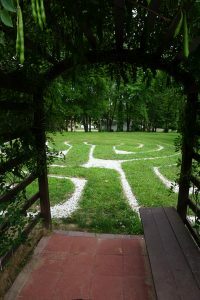 Centuries ago, the labyrinth symbolized a path to the Divine with a clearly defined center (God) and one entrance (birth). It has also been noted this particular shape mimics the planet Mercury’s circuit through the sky. Labyrinths can be seen as symbolic forms of spiritual journey – as people walk the path, they ascend in consciousness and enlightenment. Most people didn’t have the means to travel to holy sites and lands, so they utilized labyrinths and prayer to achieve Oneness. These distinctive paths are still used today to help achieve a contemplative state. Walking among the turnings, one loses track of direction and of the outside world, and thus quiets the mind. Ever evolving (like us! ), congregants and volunteers continue to develop this special place with further landscaping, benches and a covered arbor to further its quiet, meditative beauty. Please feel free to walk the labyrinth anytime and be open to whatever may be revealed to you..